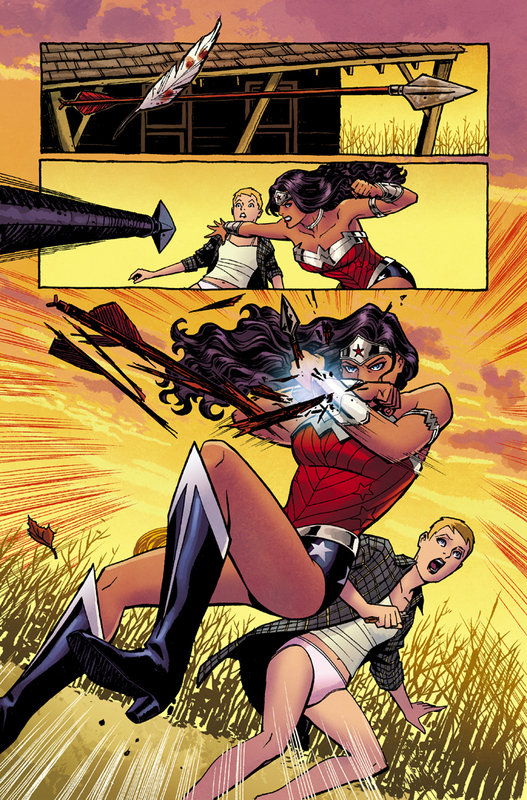 This is a fun first image… it’s always a good time when Wonder Woman is deflecting things with her bracelets. Plus the art is fantastic. AND classy. Wonder Woman looks like she’s going to spill out of her top in every Justice League image we’ve seen so far, but she appears well secured here. Nothing is gratuitous, which is a nice change from some of the other relaunch art we’ve seen so far (I’m looking at you, Harley Quinn… AND Catwoman… AND Starfire). She’s not wearing pants, by the way. It remains to be seen whether the briefs or the pants are the official outfit. Or perhaps she adjusts according to climate… it seems rather warm in this particular locale. I can’t wait for this book!! I hope we get some more art from San Diego this weekend… Cliff Chiang is the best. This entry was posted on July 22, 2011 at 3:28 pm and is filed under Comics, WW Comics. You can follow any responses to this entry through the RSS 2.0 feed. You can leave a response, or trackback from your own site. I’m actually really hoping the whole issue is full of pants-less people. So far so good… we’ve only got 1 of the 20 pages, but that’s 5% towards your pants-less dream! !